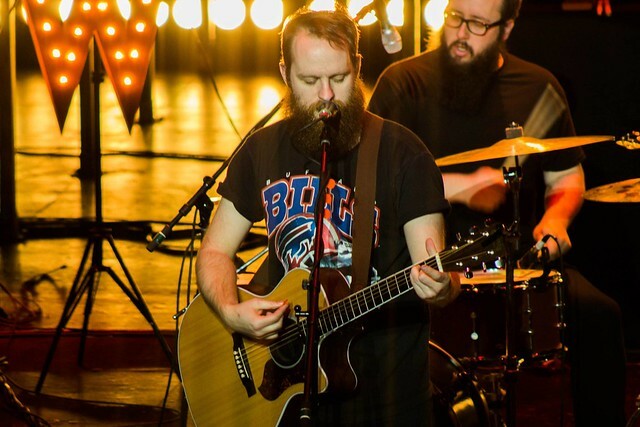 Point Park University's record label, Pioneer Records, and the University's Title IX Office hosted a concert March 31 at the Pittsburgh Playhouse with national recording artist Aaron West and The Roaring Twenties to kick off April being Sexual Assault Awareness Month. Point Park sports, arts and entertainment management majors collaborated with students from the University's Conservatory of Performing Arts to raise awareness and put together a sold-out show, which also featured special music guest Drop the Act. "It was so great to see SAEM and COPA students working together to pull off this sold-out event. The SAEM students managed the front end of the concert from unloading equipment and setting up, to greeting the artists and catering to their specific needs, while the COPA tech majors designed lights, ran lights, followed spots and assisted with load in and load out," said Kim Martin, producing director for the Pittsburgh Playhouse. "All hands were on deck for everything. It was a wonderful collaboration," Martin added. "I'm proud of how well the students booked the bands, executed the contracts, marketed the concert and took on day-of-show responsibilities with the assistance of Ashley Dobransky, School of Business assistant to the chair, who is always providing meaningful advice and guidance to our students," said Ed Traversari, M.B.A., associate professor of sports, arts and entertainment management. Traversari added: "These students plan to make working in entertainment management their livelihood so we make sure they are well prepared." SAEM major Molly Knepper from Richland High School in Johnstown, Pa., said that interning for Pioneer Records has prepared her for a career in the music industry. "I have learned how to book a show full circle. Ed has been my major mentor, pushing me to achieve what he knows I can do with booking. I have also learned how to run a record label well and feel prepared to work in this type of atmosphere," said Knepper, who booked both bands for the concert. Knepper added: "One of my favorite moments at the show was seeing how excited the fans were when they saw Dan Campbell, lead singer of Aaron West and The Roaring Twenties. Also an SAEM major and Pioneer Records intern, Amber Montz from Terry Sanford High School in Fayetteville, N.C., helped with booking and coordinating student volunteers for the day of the show. "Pioneer Records has prepared me for a career in the entertainment industry by allowing me to work in real-life situations, yet be able to ask questions and learn," Montz said. Title IX Coordinator Elizabeth Rosemeyer, J.D., organizes opportunities for students to become aware of the issues surrounding sexual violence, including how to prevent it and how to respond to survivors of sexual violence. "This concert was a great opportunity to provide a fun atmosphere while also raising awareness of the prevalence of sexual violence among college students. Sexual violence, including dating and domestic violence, is an issue which crosses all areas of a university, regardless of major, year, resident or commuter students, or gender," Rosemeyer explained. "We worked together to make the event memorable for everyone involved," said Angelo Gargaro, coordinator of student conduct at Point Park. Gargaro added: "Being part of a college or university means you are part of a community. We need to help each other and look out for everyone. Title IX does amazing work and the messages of "Break The Silence' and 'It's On Us' are crucial for students to hear, understand and act upon. The concert was a great way to spread the message, bring students together and make our university community even stronger."